Da Da Da Da Life Goes On*: Alex and Yvonne are one! 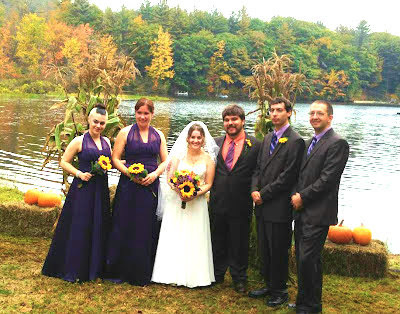 Yesterday we welcomed Yvonne Wolfson into the Clan McDougall, "Von" and our youngest son Alex were married in a beautiful lakeside ceremony in New Hampton, New Hampshire, followed by a lively reception held in Paul Wolfson's garden in Campton. The party lasted late into the night, culminating with fireworks, and a bonfire. Draga Yvonne şi Alexander, Casa de Piatra!